the classics with eileen fisher. Classics make the world go round. I am a sucker for classic pieces that are easy to throw on and run out the door in. This outfit is full of classics. White and black combinations are the classic-classic combo. With the warmer weather approaching I have been grabbing my white pieces more and more. This Eileen Fisher top has been added to that rotation. This classic white tank has the perfect amount of stretch. You can't see in these photos but it is more of a tunic so it can be worn in different ways. It's breathable jersey that has such a crisp white color perfect for the warmer weather. These faux leather leggings are great and different from my previous leggings. The thick band and high waist fit make them easy to wear and more versatile than traditional leggings. Because of the high-rise pants, I decided to tuck in the longer tank and throw a belt on to make it look a little more tailored. 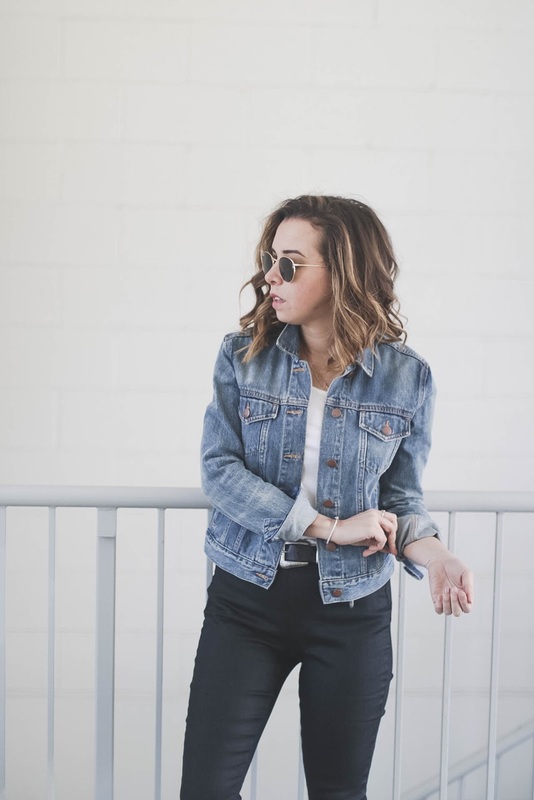 Jackets and layering are part of my go-to classic look and in spring I love to throw on my denim jacket. No matter what colored bottoms you wear I feel that a denim jacket pairs perfectly. The oxfords are another classic favorite of mine. The brown leather and traditional look add something I like to call "old man spice". Love this outfit! It is so easy and laidback!